It's Quilt National entry time again. Already I've had four friends call or email for advice and/or commiseration -- not about their quilts but about the entry. So I planned my afternoon around the process. I am no newcomer to online entries so I do the regular preparation. I get all the images properly sized and named and in a separate folder on my computer. I find the list of things the system is going to ask for and type them out in a Word document so I can copy instead of type into the actual form. I get my credit card. This should not be such a big deal. Well, I'll spare you most of the gory details and just give the highlights. I realize that I've written pretty much the same damn rant twice before, after entering QN '13 and QN '15. The same dumb features of the entry form, the same dumb password woes (yes, Virginia, you should start entering before lunch, because you know for sure that you have forgotten the password you gave two years ago and will have to wait for them to send you a new one which takes about a meal's worth of time to show up). The same dumb system where you do entry #1, proceed through credit card checkout, and then return to do entries #2 and #3. They have fixed a couple of things. Now you don't have to type in the info like "Have you exhibited in any previous Quilt National?" three times; you can click here and everything you typed in for the first entry will be copied into the new form. You still do have to type in the materials and techniques twice for each quilt, once on the full view page and once on the detail page. And they still ask you for the month of completion, which I suspect 75% of people will make up rather than try to reconstruct from their work logs. Something new: "Brief History of Exhibition and Publication. Please indicate any public exposure for your work as an artist. This includes shows and exhibitions as well as publications." I think they allowed 500 characters in the little box, so yes, they do mean brief. What are you supposed to put there? I was passive/aggressively brief, told them a couple of big shows and then said "numerous shows and publications." I wonder what they are going to do with this info. I had two klong moments, one where things came out right by accident, one where they didn't but I hope it won't be fatal. First the good news: I didn't realize until after I had hit the submit button for entry #1 that they had never asked for my name on the entry form! Of course they did on the credit card page, but there they wanted the name on the credit card. As it turns out, the name on my credit card is the name I want my work exhibited under, but I bet that isn't the case for many people. I'm sure you could get this kind of thing straightened out eventually before the catalog gets published, but why don't they ask for your name to begin with? 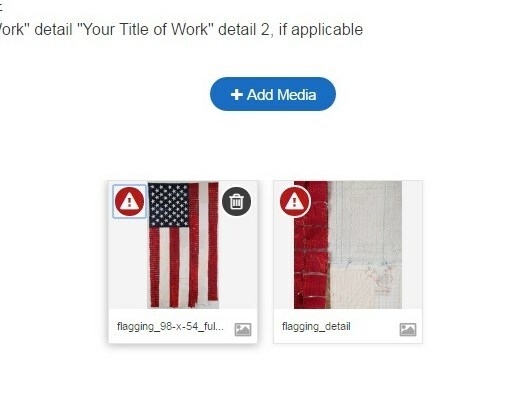 Now the (maybe) bad news: You upload your image, which is pre-named something like "fading_59-x-99_full" and when you come to the page where you're supposed to fill in info about the quilt, the name of the image pops up automatically in the "Title" box. I stupidly went on to the second box and proceeded down the page, without erasing "fading_59-x-99_full" and typing in "Fading". I realized my error only after I had submitted entry #1 and proceeded to #2, at which point it was too late to go back and fix #1. Yes, I was stupid. But yes, the entry system was stupid too -- why did it choose to autofill that box, knowing it was going to come up wrong, instead of just leaving it blank for me to fill in correctly? I hope that if this quilt gets into the show somebody will notice that "fading_59-x-99_full" isn't your typical quilt title, and call me up for clarification, but again, why not set up a process that avoids such problems? I'm not the dullest needle in the pincushion, and if I have so many frustrations I bet a lot of other people do too. I say it every time, and I'll say it again -- why don't show organizers have somebody sit down and pretend to fill out the entry form before they open for business? And then why don't they fix some of these glitches and stupidities? Wouldn't it be nice if your customers would be able to write blog posts about how easily they did their online entry? Besides the best in show, the Bluegrass Biennial had several more fiber pieces. I loved this piece -- beautifully "drawn" with hand stitching and with a real needle and thread in her hand. I liked the contrast between the beautifully crafted face and the crude bunching of vintage fabrics to make her patchwork skirt, between the precise hand stitching and the casual raw edge applique. So frequently fiber art faces are too cute or overly Photoshopped, but this one is realistic without being sentimental. This piece seemed very retro to me, reminiscent of the 1960s, when artists were newly emboldened to show fiber in its raw state. Here's a combination of knitting, felting, and hanks of curly wool just hanging out. More fiber art from the Bluegrass Biennial in my next post. The Bluegrass Biennial, a juried, all-medium art show, is held every other year at the Claypool-Young Gallery at Morehead State University. It's open to any artist living in Kentucky and always has a great diversity of mediums and techniques, especially "materials-based," "craft" kinds of work that are sometimes scarce among the paintings in mainstream art shows. This week I went to the closing reception and was pleased to find that eight of the 37 pieces were fiber, including the best in show! Best in show was this series of five embossed paper sheets by Deborah Levine (full disclosure: she's my close friend and art pal). Each sheet is embossed with a swatch of knitting. In sheet one, the swatch sits at top left. In sheet two, a bit of the the swatch has been unraveled and the free end has been used to cast on and start knitting a new swatch at bottom right. In sheets three and four, the original swatch loses more and more yarn, while the new swatch gets bigger; finally in the last sheet, there's only the new swatch at bottom right. I was struck by how well the paper took the imprint of the knitting (she used a nylon cord that didn't get waterlogged during the casting process) and how the story was so engrossing. A beautiful piece. Deborah has another piece in the show, also made from fiber. This one had a bunch of cylinders made from wrapped and tied strips of fabric, made rigid with an industrial-strength plastic medium and mounted on a found board. Her urge to narrative surfaces again in this piece, with the abstract wrapped forms taking on life -- tilt your head 90 degrees and they might be boat people heading for refuge on a tiny raft. I'll show you more of the fiber works in the show in subsequent posts. Readers of a certain age may recall Abbie Hoffman, the 1960s counterculture and antiwar provocateur who wrote a book titled "Steal This Book." I am going to steal his title and encourage all of you to steal this book idea. Last week I wrote about a little book that I made from selectively reading the newspaper for two weeks, clipping all the words "early," "late," "earlier," "later," "earliest" and "latest." Then I arranged them into lists and theme groupings, some of which started to feel like poems. Several people left comments that they were intrigued by this approach, and one even said "I am fighting hard against the idea of stealing this idea." Well, I'm here to tell you STEAL IT!! I think this concept, which I'm going to call "newspaper poetry," is a neat idea and I would love it if other people would take it up too. This is not the first newspaper poetry project I've done. In past years I did several collections of haiku clipped from the newspaper (read about all my found poetry projects here). I'm no stranger to reading the paper with a scissors at hand. I've learned several practical things, such as keep a scissors right there, put your clippings immediately into a little envelope, and wait till after your husband has read it before you start cutting. I've also learned that your subconscious mind starts arranging the bits into coherent piles long before you actually get around to pasting up the book. I love this artistic approach so much that I've already started clipping for two more books. One is about questions (and after a couple of days I'm already amazed at how many times questions appear in the headline, not just in the story) and the other is about explanations of how to pronounce something. I'd like to put out a challenge to any readers who like text, and like making little books, or even to those who like only one of the two. Find a theme, and make a little book! Then send me a picture and I'll show it to everybody. - the words "bride" and "groom"
Just cut out clippings for a week or so and see how it's going. Worry about making the little book later. Have fun! My son sent me an email the other morning -- "Do you have fiberfill?" What on earth could this be about? He said it was for a secret project and he would come over and show me. It was about five inches long and four inches across. This required further explanation. My son being the kind of guy he is, filed away that remark and said to himself, "that couldn't be too hard." So he found directions on the internet, bought some yarn and a crochet hook and went to work. As you can see, there were a few glitches in this first segment, including that protuberance on the right-hand end which we think was supposed to be a flat base. Fortunately he lives only two miles away so he could come over for consultation several times. His purchased crochet hook went MIA and he had to come by for a replacement. We stuffed the segments and figured out how to sew them together. We found the perfect hemispherical red eyes in my button box and embroidered a blue smile. Here's the surprised recipient with her new toy. I bet next year she will think carefully before she says what she really wants for her anniversary. I belong to an art book club that hardly ever reads books. We used to, hence the name, but stopped some time ago and now we do "whatever" according to each month's theme or subject. Some people might report on what they or other artists have done on that subject or bring in relevant books, others might put together slide shows or photo suites on the subject, still others might make a piece of original art. If you choose that last response, of course, it usually turns into a big project -- often a bigger one than you had intended at the start. And that's what happened to me over the last month. Our theme was "early and late" -- ambiguous, yes, but that sometimes makes for the most interesting discussions. I stewed for a while over what to do, but then came up with the idea to look for the words "early" and "late" in the newspaper, cut them out, and do some kind of compilation. I did that for two weeks or so, and then it was time to start actually compiling. Last week I claimed the kitchen table for my workplace, and spread out, cutting the words more neatly out of the clippings and sorting them into theme piles, such as minutes (a few minutes later, ten minutes earlier, twenty minutes later...) and centuries (the late 18th century, the early 20th century). That took two days. Then started pasting them into a little accordion book. Fortunately the design of the book was such that it was easy to add four new pages at the end if I decided I wasn't finished yet. This occurred several times. An experiment: go to your newspaper and find a single word or perhaps a two-word phrase that you want to put into a little book. Cut it out -- pretty little, isn't it? Did you find it hard to even hold onto the paper when you got to the last cut? Did you drop the little piece after that last cut? Can you find it again? Now paste it into your little book. Still pretty little, isn't it, and now it's covered with glue! How are you even going to peel it up off the scrap paper? How are you going to position it perfectly in your little book? (Answer: needle-nose tweezers.) Wash your hands frequently, because they're getting all black with ink and sticky with glue. All this is time-consuming. If you love fiddly little projects like this, as I do, you will find yourself slipping into a zen state, happily cutting and sorting and pasting as the hours and days tick by. I found myself contemplating the subtle differences in meaning between "late in 2014" and "in late 2014," between "fifty years earlier" and "fifty years ago," between "her latest husband" and "her late husband." It's going to take me a while before I can read a newspaper without those words leaping out at me. I hung what I'm calling "Quilt National entry #1" on the wall in my front hallway in mid-April and it does make a dramatic statement. Actually two dramatic statements: first, "I'm knocking your socks off!!!!" and second, "I sure don't hang straight." Ever since, I have been hearing both those statements every time I walk by, and avoiding the issue of the second one. Meanwhile I sewed Quilt National #2 and Quilt National #3. Then to further postpone the inevitable, I sewed some workshop samples, and dove into my back storage room to go through boxes. I found at least a cubic yard of stuff to give away or throw away; I unpacked, sorted, catalogued and repacked a half dozen boxes of stuff; I piled stuff all over my worktable for subsequent sorting, cataloguing and repacking. I watched some Olympics. I mended some pants. I read books. But yesterday I couldn't avoid it any longer. I scheduled my date with the photographer for next week, took #1 off the wall and tried to figure out how to make it hang straight. Unfortunately then I had to get down there on the floor to work, which I probably could have done gracefully, easily and painlessly twenty years ago but sure can't any more. I got a little stool to sit on, in lieu of kneeling or sitting on the floor. And I got a chair to lean on to help me get onto and off of the stool. I didn't know whether to feel pathetically helpless or extraordinarily comical. Probably should have had somebody shoot video and go viral on YouTube. Simply cutting the threads that held the white stripes to the red stripes made a huge difference, and cutting some slits into the white to hike up the right side was even better. But how to pin them together securely enough to hold up for the sewing machine without crawling all over the quilt? Aha -- an idea. I decided to take the quilt to the photographer without totally sewing it back together first along the verticals. It will hang straight from its rod for the shoot, and then I will leave it up on his wall while I pin the bejesus out of it and take it home for its final stitches. I'll let you know how it turns out. So here's my pet peeve. 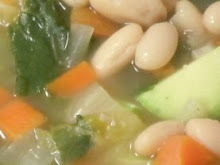 I visit a group blog that I read regularly and discover that somebody has posted a long discussion that intrigues me. The person is identified only by her first name. Her comments make me want to know who she is and more about her. I click on her name and get to her Blogger profile -- again, first name only, but here she's mentioned her home town and business. Google on the business and the town, and I find a web page for the business, which gives her name. I also find her mentioned in the regional SAQA blog. Total time to ID: maybe four minutes. So why didn't she just sign her full name in the original post? Or another version of the same peeve: Somebody leaves a comment on my blog that I consider thought-provoking and interesting. I'm familiar with her nom-de-internet because she frequently posts to a group blog that I read and in fact have recently found her posts to be fascinating. Again, I'd like to know who she is and more about her and her work. I click on her nom but this time I can't find her. Her Blogger profile is coy. I know which state she lives in and that she's a member of SAQA and SDA (or at least she has those logos on her blog) but searching both member directories gives me no clues. I waste ten minutes trying to identify somebody whose work I love. So a random fan is thwarted in trying to identify the object of her affection -- big deal. What if it had been a potential buyer or curator or publisher wanting to make this artist a proposition? I understand that some people want to maintain public anonymity as they tiptoe around the internet. 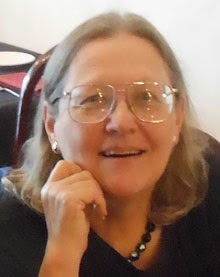 I have left comments on various blogs where I have identified myself only with a first name, but they aren't subjects having anything to do with my "public persona." If I want to say something about my favorite candidate on Dancing With the Stars it's not really relevant who I am. But if I want to post a tutorial on fiber art, review a quilt show or weigh in with opinions on SAQA's future, then people have a right to know who I am and what I do so they can properly evaluate my remarks. And I think they have a right to know that without clicking about on Google for a while. This happens on blogs all the time. It also happens on email listserve groups, which I also waste too much time reading. 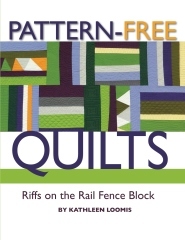 I find it especially silly that people will conceal their full names, yet chat about a quilt that was just accepted into a show (where we know the quilt will be displayed with the artist's full name on a sign), or proudly announce the release of their new book (which presumably will have their full name on the cover). I just don't understand the quest for secrecy, whether it's successful or not, when it has to do with a passion on which the person apparently wants to have some kind of public presence. I also think it's somewhat of an imposition on the people who do go by their own names who are expected to have public dialogue with Ms. Anonymous. Ever see movies where the star witness, afraid of being identified by the vicious mob boss/defendant, gets to testify with a bag over his head? I understand that, but I don't understand what these anonymous internet fiber artists are afraid of. I'm Kathy Loomis and I approve this message. I will be teaching a workshop in curved piecing in October and the organizer wanted a sample that she could show at the August guild meeting. That would be easy -- I have two or three quilt tops made with exactly the techniques that will be in the class, made at a long-ago Nancy Crow workshop and never quilted, but excellent for teaching purposes. I'll fess up, I have a messy studio. Every year or so I get the urge to clean it up, and may devote days, weeks, even months to the task, but even the most enthusiastic efforts only put a small dent into the problem. Often looking for something is the impetus I need to make a major assault, but the minute I find it I stop. I thought I knew where the box was, but it wasn't. Then I started looking into one box after another, searching. I found all kinds of other things, and decided life would be better if I reorganized them and labeled the boxes with detailed inventories so it would be easier to conduct future searches. Some of the things I found wanted to be given to friends: a bunch of beautiful polyester prints in dress lengths will go to the refugee/immigrant sewing class, a huge bag of wool yarn from Scotland that I never should have bought because I don't knit will go to my friend who does. Some stuff I even threw away. By now my recently clear worktable was entirely silted over. One box was receiving neatly folded drapery-weight fabrics to be used for quilt backs. Three were receiving works in progress, plastic-bagged and inventoried and sorted by some system almost clear in my mind. One was receiving leftovers, plastic-bagged by quilt, all color-coordinated and ready for the next (smaller) piecing project. I came upon a big bag of wooden spools that somebody had given me and took a break to put them on display in a type case on the wall that had some empty spots. I came upon two dozen small pieced motifs from a workshop that I had for some reason pinned to background lengths of fabric. I unpinned them, carefully sorting the pins back into my pin dish if they were still smooth, into a plastic box if they had rusted in place and needed a going-over with an emery cloth, bagged and packed the motifs, folded the background lengths and put them back in the box with the solid Konas. At the end of the day some things in my collection were better organized, packed and labeled. Some things were in process, awaiting future decisions. Still others were in worse shape than they started, having been let loose but not yet grappled with. And I still hadn't found the box with the curved piecing. So I made a new sample and took it to the post office just before it closed. Today I guess I have to go back in the studio and confront my unfinished business. Want to bet that within the next two days I'll find the box with the curved piecing? 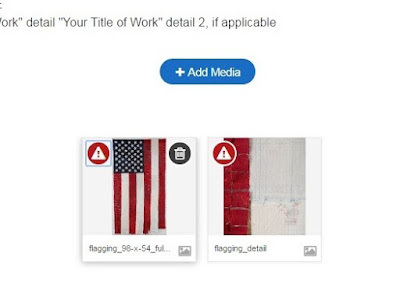 Faithful readers may recall that I've been working on my three entries for Quilt National since early spring, and that all three are American flags in varying degrees of attenuation. I am thrilled to report that I have finished the third quilt, and after a bit of remedial stitching on the first one to make it hang better, I will be ready for photography. And practically a month ahead of the September 1 entry deadline! Here is #3 on the living room floor, the only horizontal surface in the house big enough to hold it. - many, many, many spools of my own leftover thread, much of it so old that the quilt police would tell you never to sew with it. I am sorry to report that I also bought four spools of blue thread at a clearance sale, thinking I would use them on the third quilt, but I didn't like the way they looked and never used them. So I guess I'm a good ten bucks in the hole on this project.